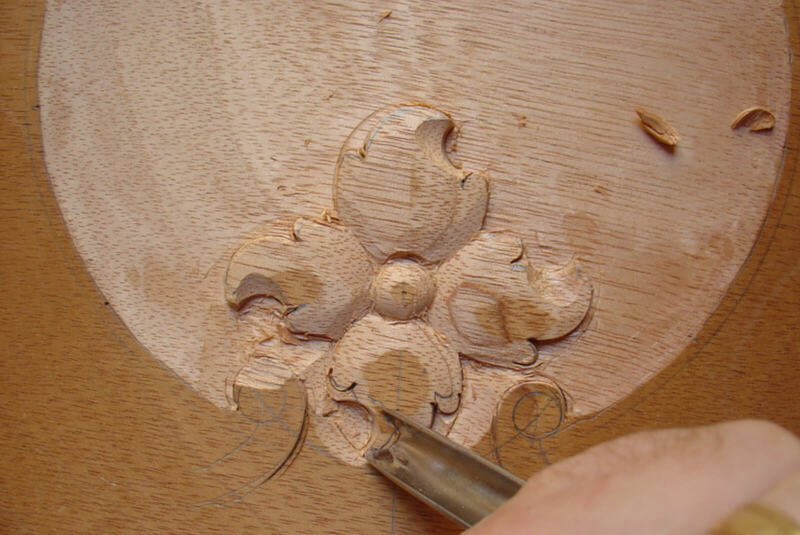 There can be a lot of drawing involved in the carving process, as some guidelines are needed to set you off on the right track. 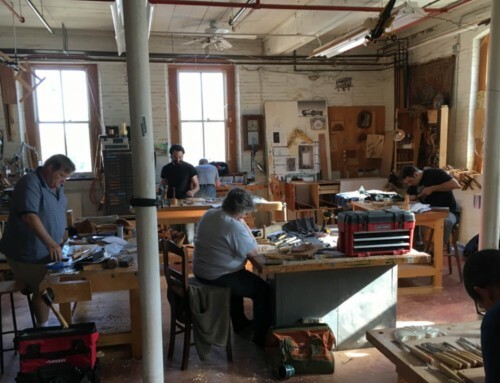 When copying old work or designing new, the most efficient designs to carve will be ones where the shapes of the carved elements correspond to tools that you have. 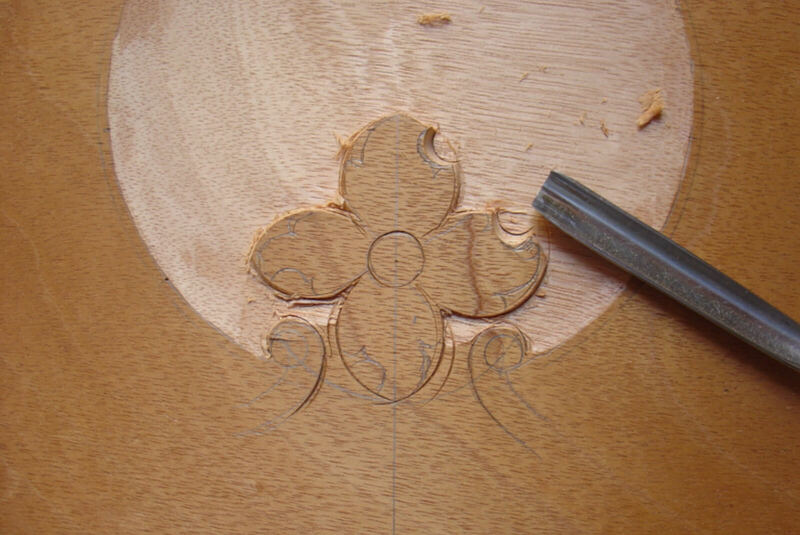 In this sequence of a draw front carving, the shapes created will be made with one cut of the appropriate tool. 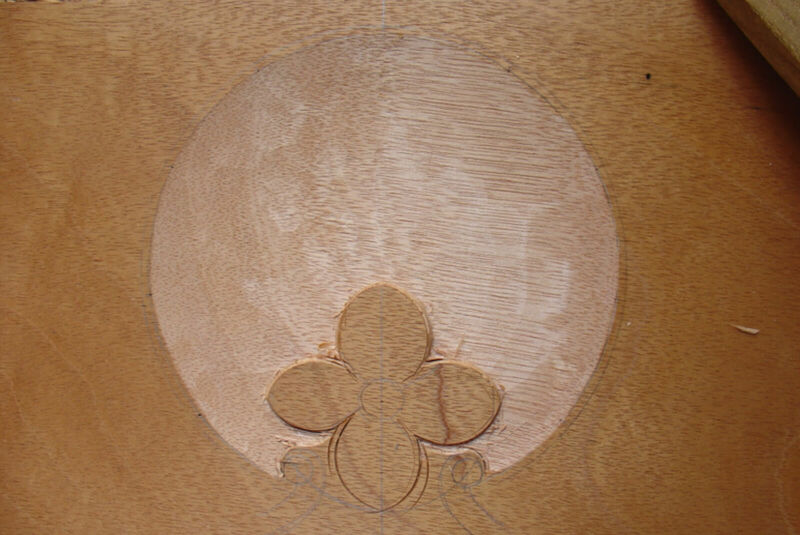 Here the central flower has been laid out. 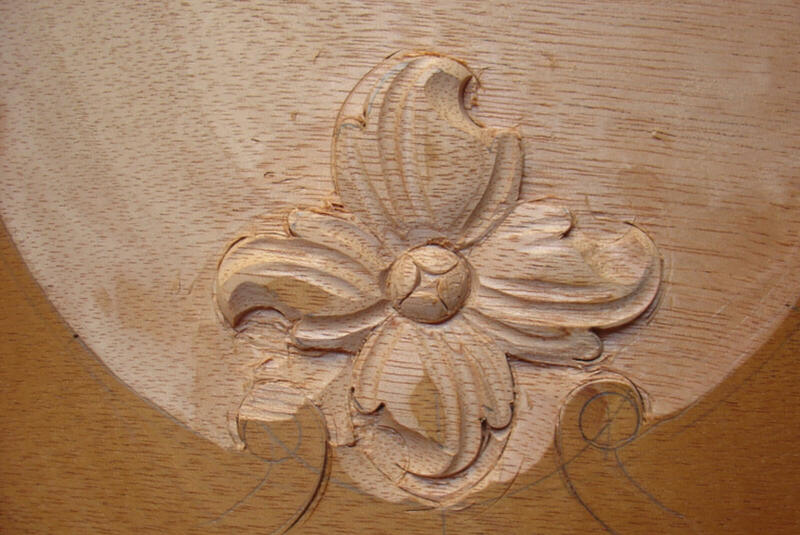 From a full size photo of the original work, I determined that an 8-30 was used to create the flower outline. The next element is a leaf division that is created with a 9-10. 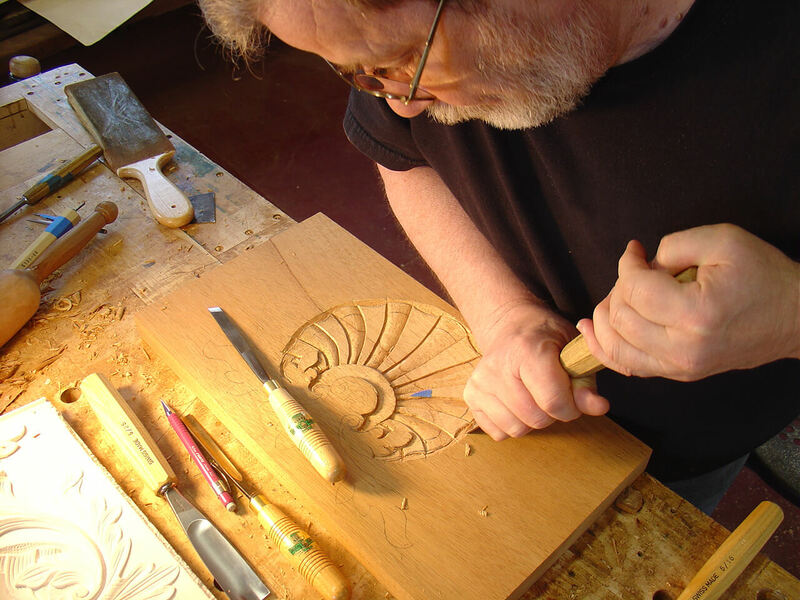 Using your tools to “draw” the elements is the best way to insure clean work and uniformity in the carving. Since there’s no guesswork, the repetitive elements will all be pretty much identical. 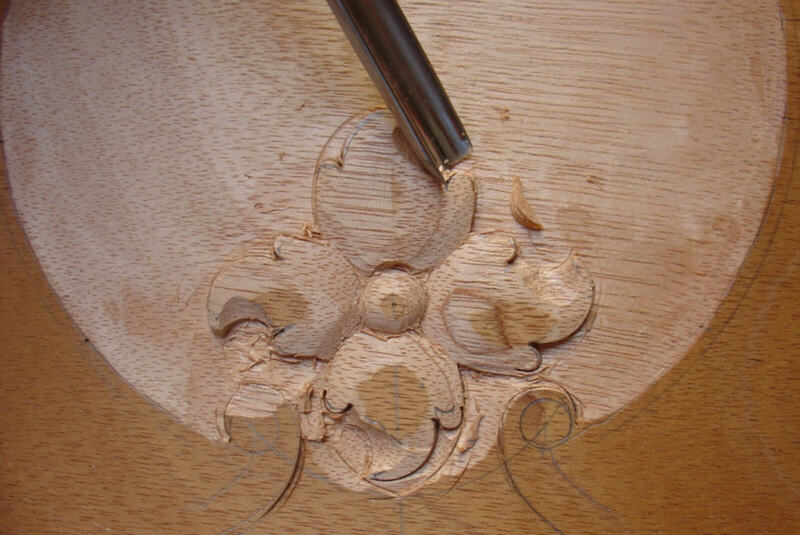 Here a 7-10 is used to create the flower center cutting along the grain direction from left and then right. 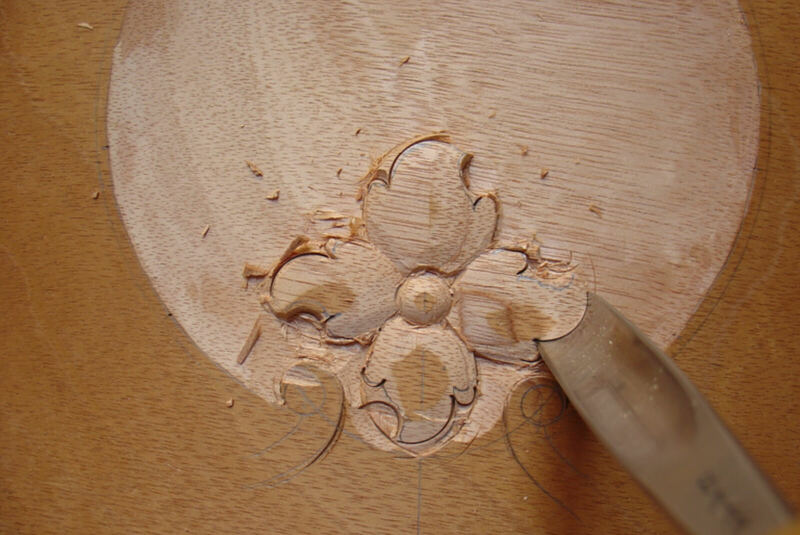 The tool was used to scribe a circle first as a safety cut so the next cuts would not rip the grain outside of the flower. 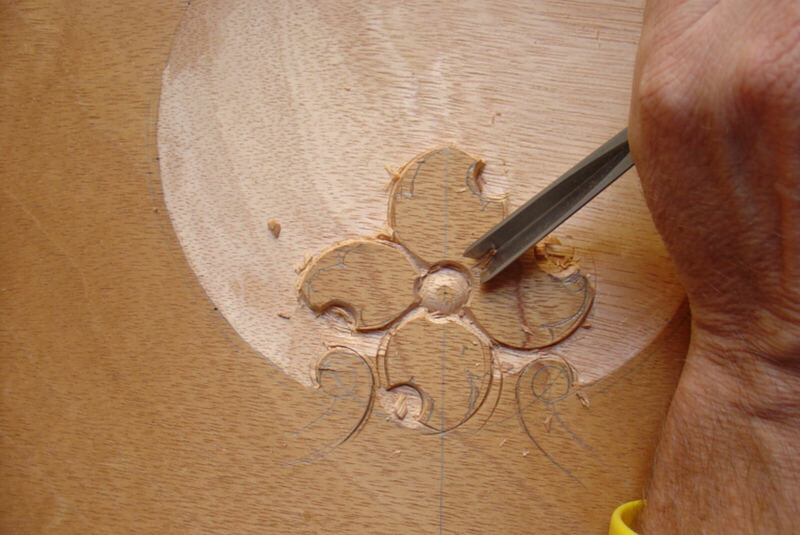 A 12-8 v-tool is being used to separate the petals from each other, cutting down a bit deeper to the center. 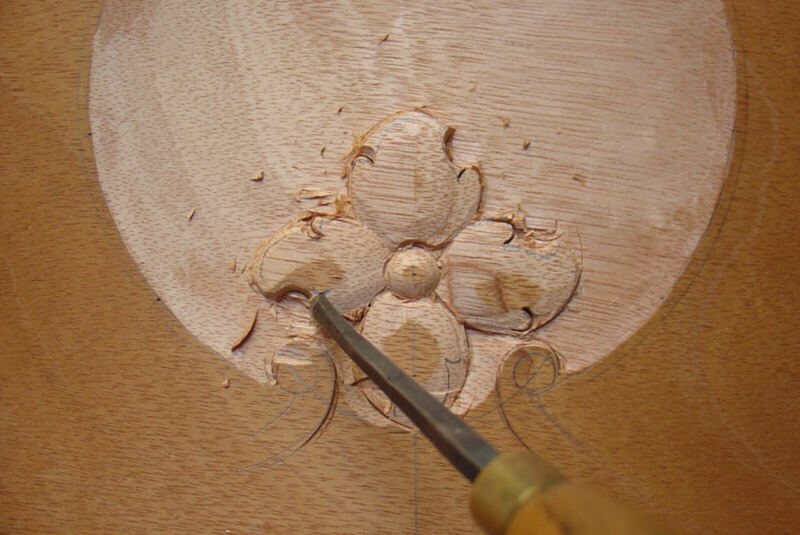 To begin shaping the petals, a 2-20 or wider comes over the top of each petal to round the surfaces. Following the #2, an 8-7 chops in the tops of the smaller leaflets of the petal. 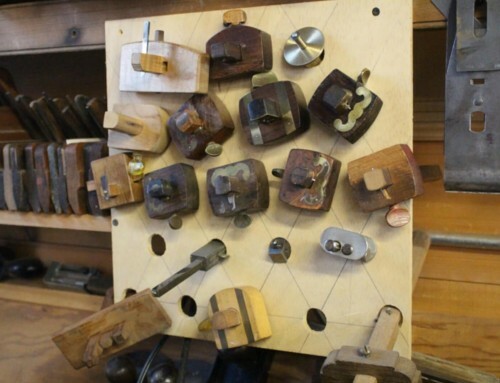 By picking a tool that will model the exact shape needed, each curve will be a perfect line and not leave any extraneous tool marks. 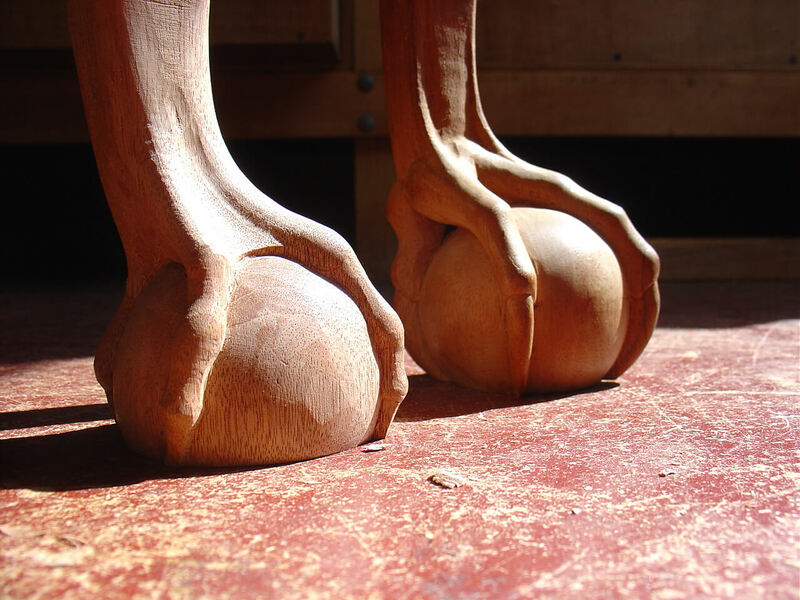 No whittling!! Allow one cut for each element to get clean work. An 8-13 is the perfect curve for the outside arc of the large element of the petal. 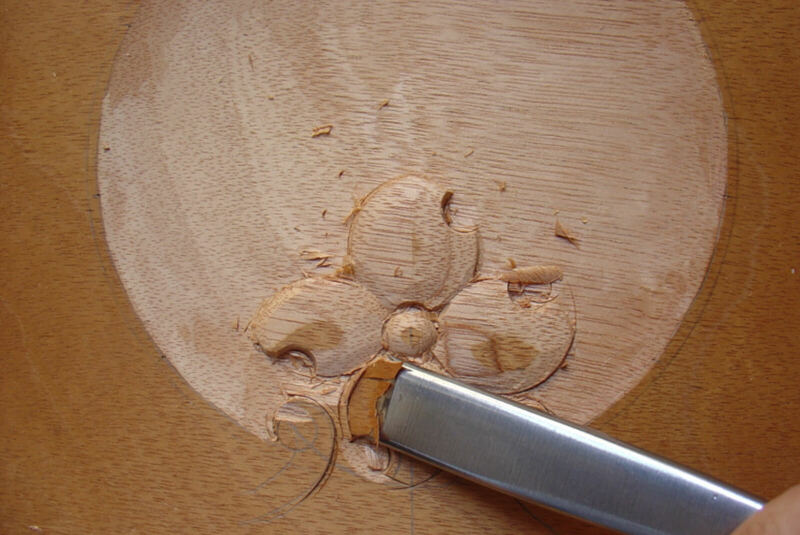 I tilted the tool back from the cut for the image, but all cuts ramp away from the center of the flower. Undercutting will weaken the edge and leave a delicate edge. 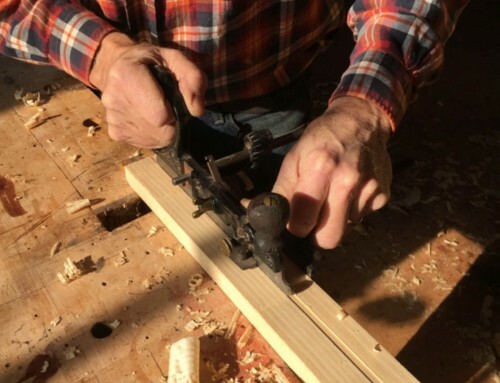 In addition, if you decide to change the shape of an element, a ramped edge will insure that there is enough material left. An undercut edge will cause your element to get smaller if you need to take more off the top. 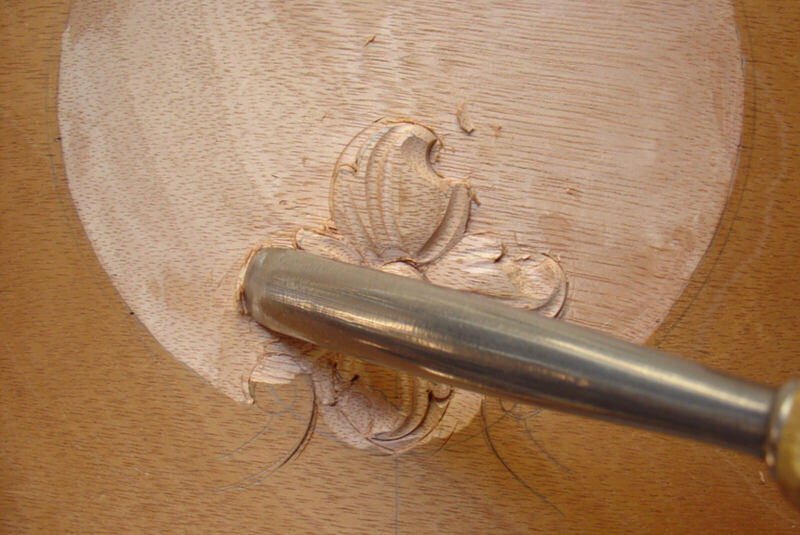 Here a #2 is used to clean up the junction between petals. A 9-10 is used to cleanly model the petal surface. And clean up the background. Here the hollowing cut from the previous image can be seen. Note how there are no start and stop marks, as the tools are used with one pass to insure a clean surface. An 8-13 cleans up the outside of the petals. 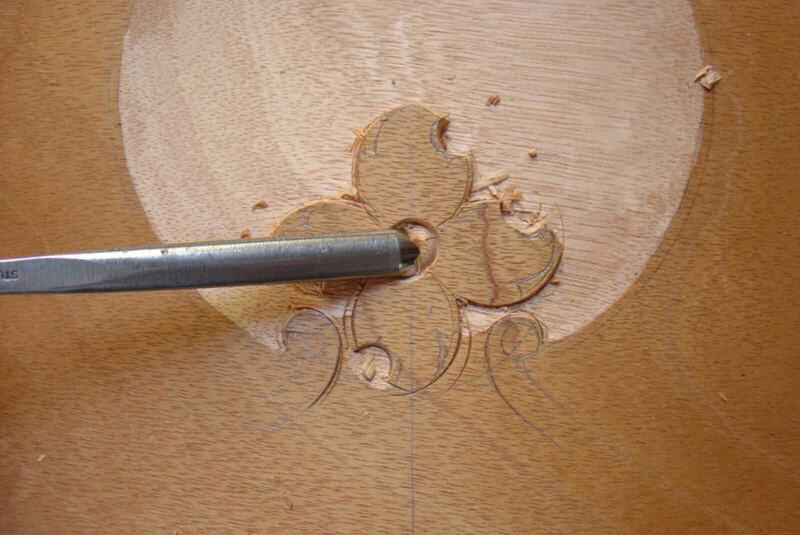 A 9-10 has been used here to divide the flower center into 4 small petals. 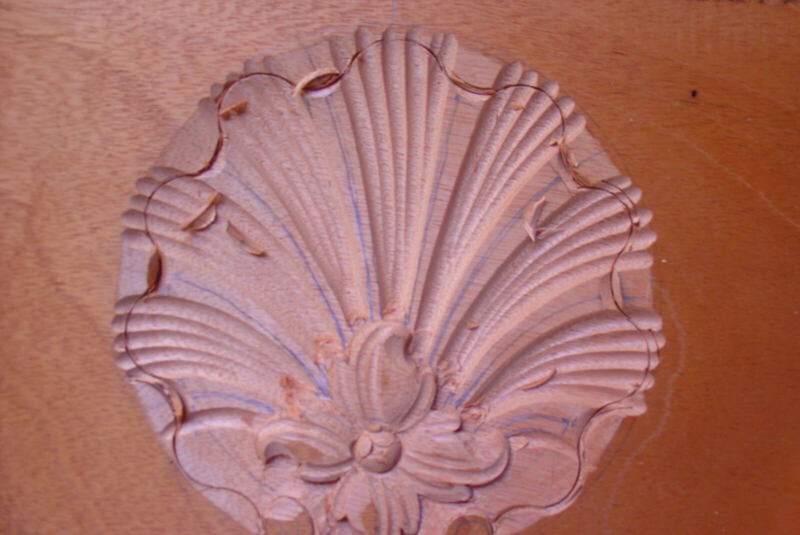 Another example of using your carving tools to “draw” perfect arcs. 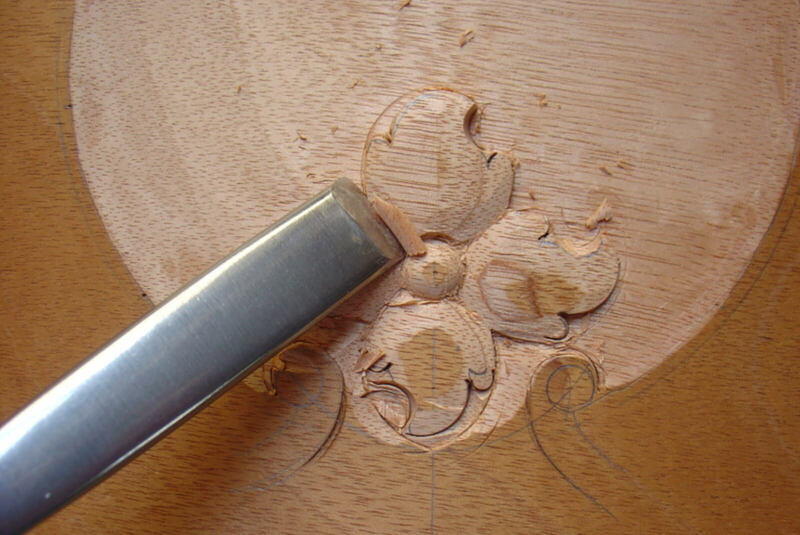 In order to minimize the risk of tearout, the cuts in the hollow lobes of the shell are cut first with an 11-7 ground back. 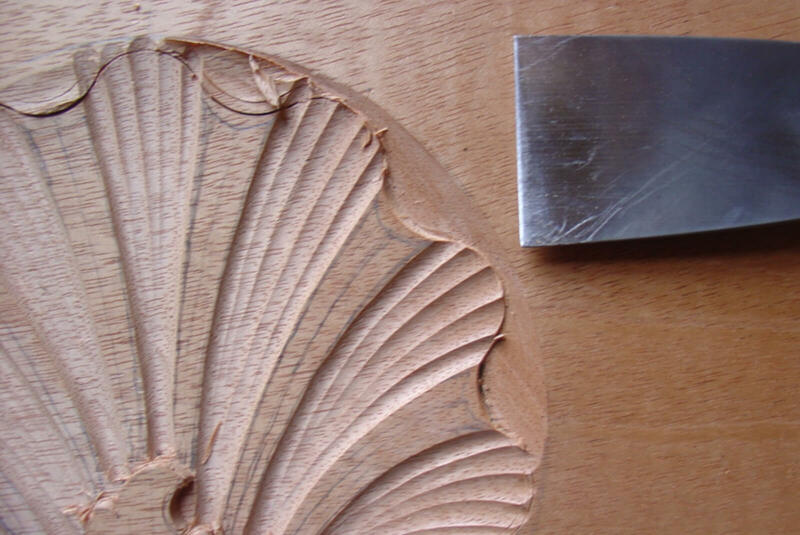 The wavy edge of the shell is then cut in with a 5-20 and a 7-20. 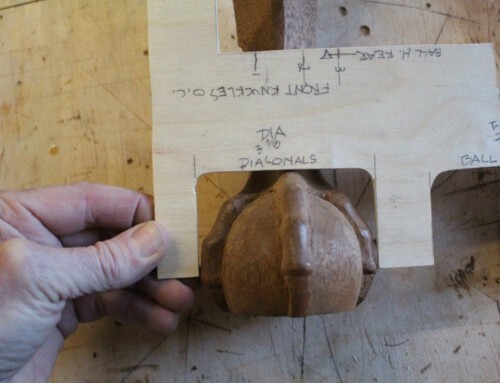 This gives a perfect and repeatable edge to the shell lobes. To finish, a 3-40 is used to clean up the dish that the shell sits in. It is the exact curve of the concave surface, and so leaves a perfect finish to the surface. What this all boils down to is tool selection. Use the biggest tool possible for the element you’re modeling. If you have a model, hold the tools up to it to make sure you have the right one. If not, use a full size image to do the same. Sometimes you will be using only the corner or the middle of a very large tool to model a small element. It’s the proper sweep that is what you’re looking for. Be brave! Keep the tool in the cut for the whole length of the leaf or vein and you will get clean and smooth cuts.